So onto the new dresses! Again, please let me know your opinions, comments, and constructive criticisms. The Aimee has an elasticized waist, a flyaway wrap skirt, pockets, and adjustable 1/2" straps on metal sliders. It's made of silk knit jersey, which can be hand washed in cold water and laid flat to dry, or dry cleaned. Again, please be constructive in your criticisms and opinions! You can dislike something, but not telling me why doesn't help me change it for the better! I'm loving that green zebra print one... it's a great use of the print that doesn't scream "I'm in ANIMAL PRINT!" and that shade of green is very current. I also love that the straps are on metal sliders. I know I'm not in the target range for your clientele, but makes me totally jealous. I'm madly in love with row 1 box 5 and row 2 box 4. Is the neckline pretty low? If so, is there enough room in your design for a cami or well fitted t-shirt for modesty when wearing to work? 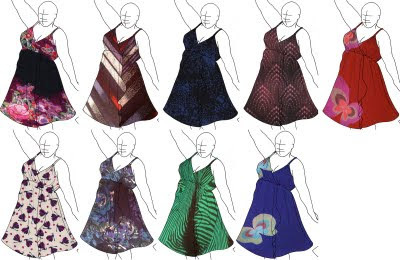 Additional question, based on the almost custom nature of these dresses, do you have a price range target? @Meredith as it stands right now, I'm in the same spot as many small companies on price point. I am not making thousands of units, and all development is on my venture, not spread across a large conglomerate, so the price point is competitive with other designers on the higher end - about $200 - $275 per dress. That itself already takes some creative hurdles. If I am able to fund a bigger run based on bigger orders, prices can drop, but volume is truly the name of the game in clothing sales. As far as the room for a cami/tee/pretty bra, absolutely there is room. The neckline is a surplice (wrap front), which means one could wear something underneath for modesty, but it crosses in front so it won't fall open. 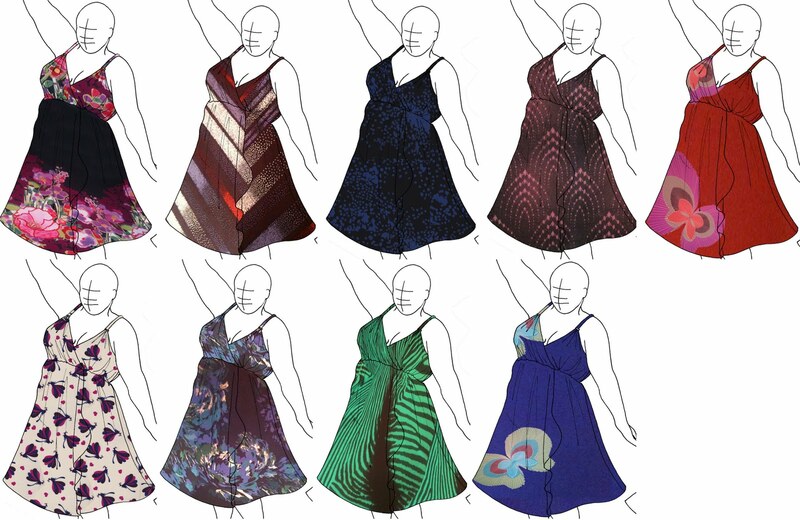 I agree with Meredith: I love the last dress on each row. To me it has an Asian aura. @Sandra ooh nice! It's a lightweight georgette, but yes, I can completely see the Asian aspect too. Thanks for the comment!